Click here to visit website to see story or read below. Chuck-e-Cheese’s slogan of “where a kid can be a kid” has always seemed inaccurate to me. I find nothing reminiscent of childhood in a commercially crafted space that sends my kids into a sugar-induced frenzy and sends birthday parties scattered to the winds as each child scrambles to earn much-coveted tickets to exchange for junk. Trips to the place usually end with me craving Tylenol or a glass of wine – or both. My children’s ideal birthday party space involves open spaces for play, room for adventure, and time outside. Thus, for our daughter’s sixth birthday party we headed to Braehead Farm. We rented the Red Shed, which provided us a shelter from the fall temperatures and a private space for cake and presents. Party guests gained admission to the playground in the barn lot and could swing on “horses” and “steers,” feed pigs, pet goats, play in huge sand piles (our son’s favorite activity), swing in a hayloft, and follow free-range hens across the yard. We had the added benefit of having Alison’s party coincide with their Fall Festival (which runs through Nov. 3), but the farm is fun any time of the year. 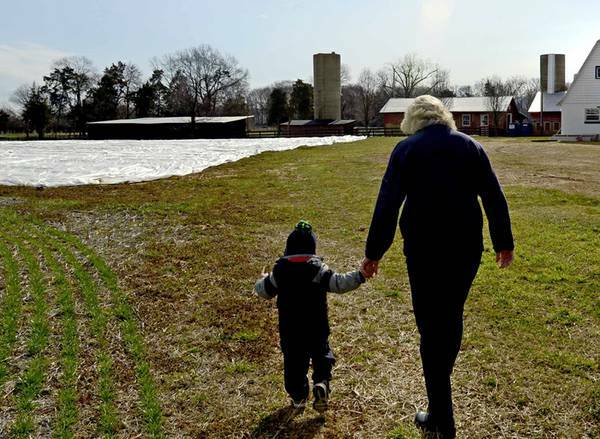 Braehead is the last remaining working farm within Fredericksburg city limits, and it is a gem of a place. Events on the farm follow the seasons; they have strawberry picking in the summer, a pumpkin patch and hayrides in the fall, and they will have holiday events through December. Season passes for the playground in the barn lot are available. For the party, we had a group hayride, ran through the corn maze pretending to be chickens, balanced across a log trying to avoid the “troll” (me), and took turns swinging in the hayloft. I had planned a few party games, but we did not need them — the kids had so much fun, you guessed it, just being kids. Click here to see the article in the June Issue of Front Porch Fredericksburg. Article courtsey of the The Free Lance-Star. Click here to see article on their site and photos. 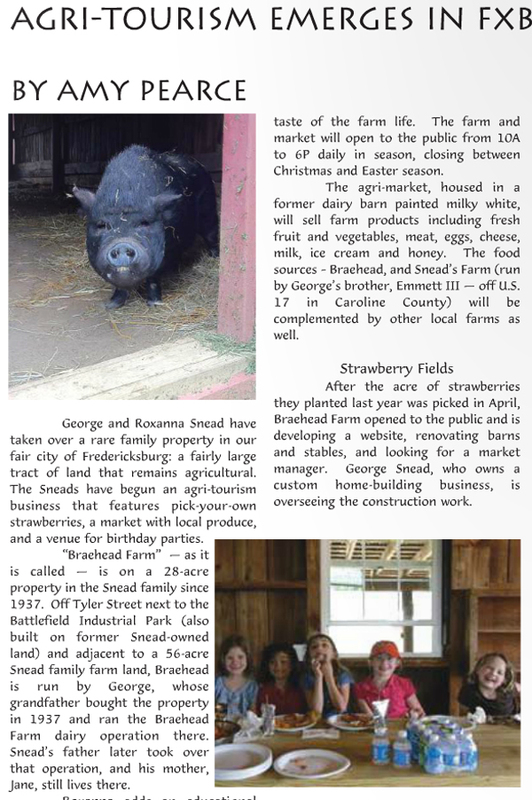 The Snead family is starting an agri-tourism business in Fredericksburg that will feature pick-your-own strawberries, a market with local produce and a venue for birthday parties. The business, called Braehead Farm, will be on a 28-acre property that has been in the Snead family since 1937. It’s off Tyler Street next to the Battlefield Industrial Park, which was built on land the Sneads formerly owned. The family also farms an adjacent 56-acre property.